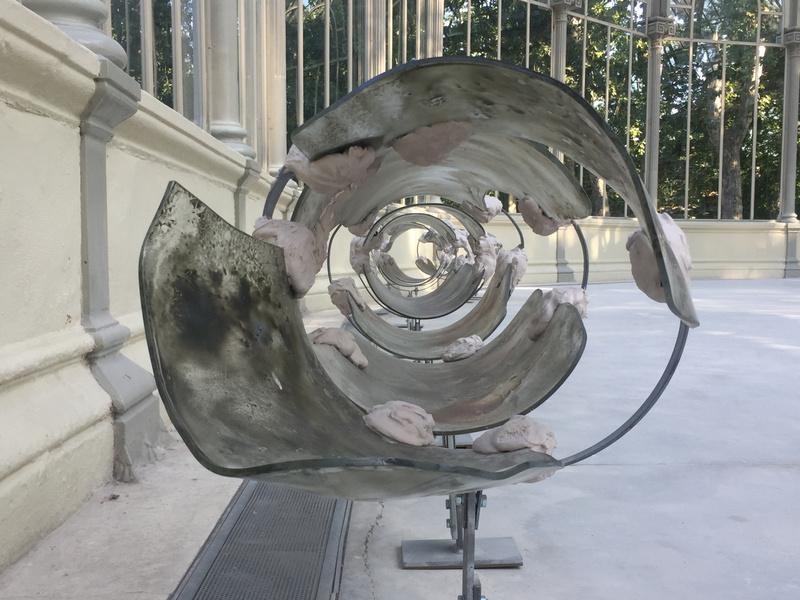 Nairy Baghramian, Breathing Spell, 2018. Sandrine Barbeaux is a Belgian independent art consultant and artists manager who has been specializing in Chinese contemporary art for 11 years. She focuses her activity in bringing awareness and content in the East-West dialogue through artistic and cultural projects. Permanently based in Shanghai until 2011, she collaborated with institutions such as the Shanghai Art Museum, MoCA Shanghai, Pingyao Photography Festival, Shanghai Biennale, Shanghai Concert Hall, Shanghai Grand Theatre, galleries and private corporations. She curated the Art Corner of the Belgian Pavilion for ShanghaiExpo2010 and organizes “out of the beaten track” trips for European collectors, art professionals and amateurs to China. Nairy Baghramian has gained an international reputation for her sculptures, photography and site-responsive installations that are all characterized by explorations of three-dimensional forms. By playing with the architectural narratives of the spaces in which she is invited, the artist questions the status of sculpture and its role in institutional scenography. Her works are always being referenced in a number of ways, from the formal language of minimalism to surrealism and interior decoration. She also associates elements that cannot be bound when she combines functional and ornamental, industrial production and craftsmanship. She uses materials like steel, resins, silicones or leather to create sculptures that adopt organic forms – with the excrescences and cavities of human physiology – or take the form of decorative objects. Her work often relates to the hidden elements of architecture, which are vital to how the building functions. She also creates organic clones of piping ducts, fire hoses and other devices that detach from their circuits and appear dysfunctional, like artificial limbs that are disconnected from the body. In Breathing Spell (Un respiro), her first solo exhibition in Spain, Nairy Baghramian questions the function of sculpture, architecture and installation, and by extension, the Reina Sofia Museum as an institution. 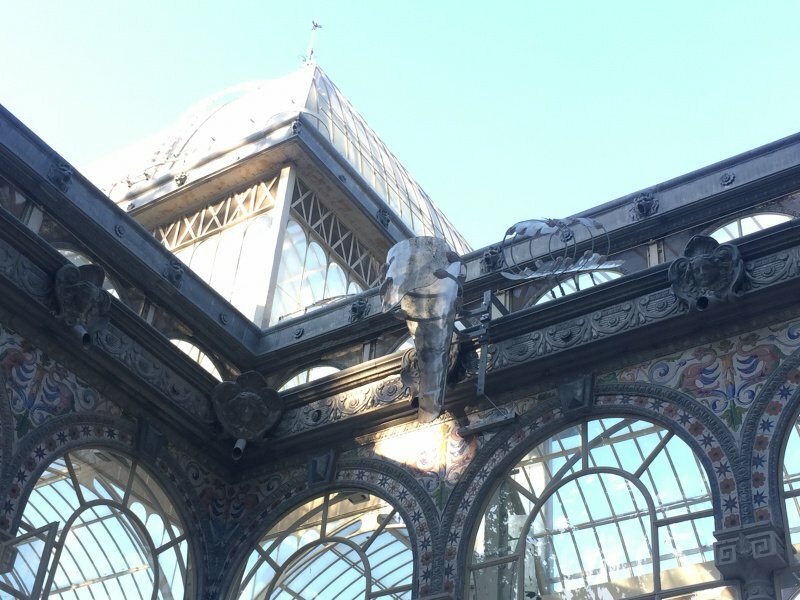 The installation embraces the Crystal Palace, both inside and out. While approaching the metallic structure, the viewer can see organic translucent protuberances, which are hooked to the skeleton. The artist’s appropriation of technical devices call the viewer’s attention to embedded parts of the architecture, which are usually overlooked. The entrance to the glass building is also quite astonishing, as the works are integrated in such a way that the entrance seems to be, at first glance, empty. The organically-shaped sculptures are suspended on the palace’s anatomy, not at its center, so that they look almost like ornaments. You need both time and a sense of tranquility to stroll through the exhibition to fully appreciate them. The show consists of semi-transparent pieces of uniform tones, inspired by the colours of their surroundings. They are made out of steel, silicon and resin, and hang from the iron pillars supporting the building. The fragility of the diaphanous creations is emphasized by the enclosure chosen for the exhibition, and the glass skin emphasizes this fragility, bringing an extra brittleness to the work. The choice of the Crystal Palace as an exhibition venue for Breathing Spell becomes clear during the course of a visit to the show. 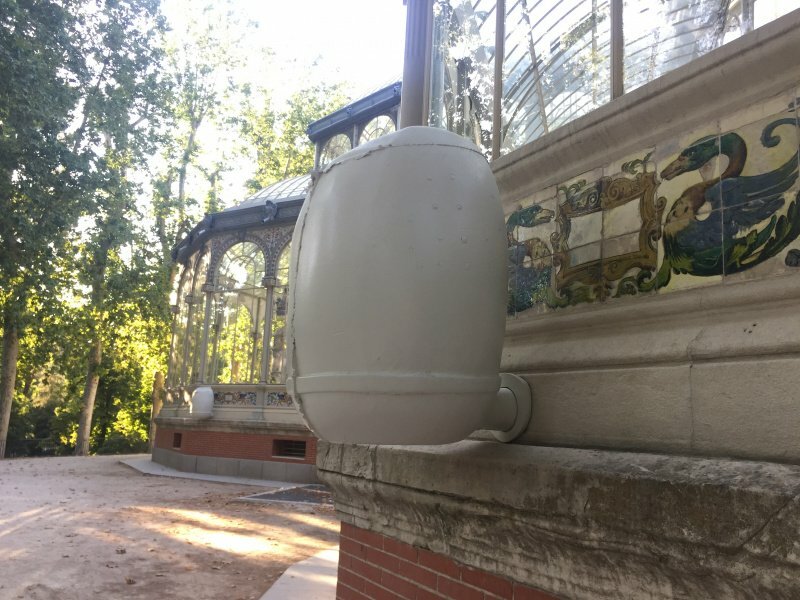 There is firstly the contrast that is generated between the hubbub of the city and the fresh air of Retiro, and also the natural light that is mixed with the light that’s filtered through the glass and the artworks. The vegetal environment and its changing lights fully reveal the power of Baghramian’s artwork, perhaps more than if the exhibition had been shown in a white cube in the Reina Sofia’s main building. Conceptually, its occupation of the liminal space between the building’s innards and its exterior surface demonstrates the importance of the venue as a space of appropriation and idea generation. 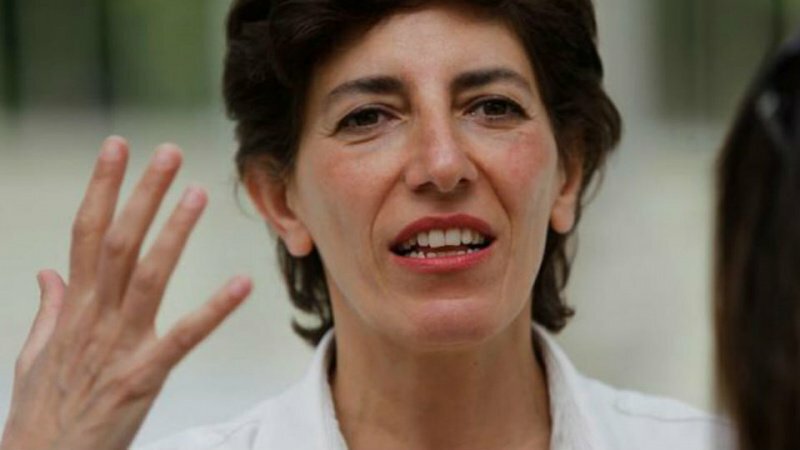 Inviting Nairy Baghramian to exhibit here introduces the notion of an institution opening itself up to transparency. It also provides an implication about the viewer in the artistic context and a reflection on the role of the museum in the public sphere. Nairy Baghramian was born in Isfahan (Iran) in 1971. Her work has been the subject of solo exhibitions in a number of institutions, including Museu Serralves, Porto (2014), the Art Institute of Chicago (2014), Museo Tamayo, Mexico City (2015), the Walker Art Center, Minneapolis (2016), and Gent’s S.M.A.K (2016). Baghramian also participated in the 54th Venice Biennale (2011), and more recently, at documenta 14 in Kassel and Athens (2017). She lives and works in Berlin. 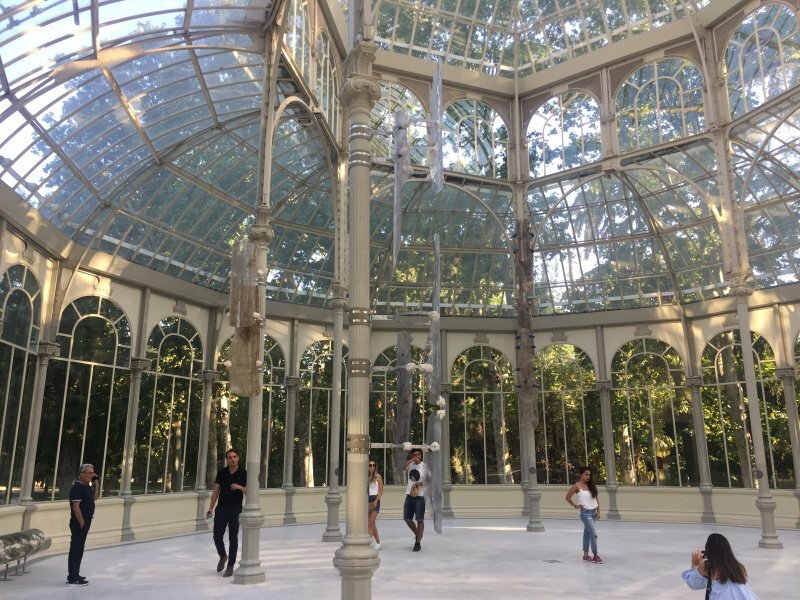 The Crystal Palace (Palacio de Cristal) is situated in the Retiro Park and is one of the finest examples of iron architecture in Madrid. The metal and glass structure was built in 1887 for the Philippines Exhibition of that year, when the Philippines was a Spanish colony. Designed in the shape of a Greek cross, it is made almost entirely of glass and is set in an iron framework on a brick base, which is decorated with ceramics. Its cupola makes the structure over 22-metres high. Designed by Ricardo Velázquez Bosco, the project was inspired by Joseph Paxton’s Crystal Palace in London. It was originally planned as a gigantic greenhouse that contained tropical plants, but it is now used for exhibitions.